Wise Entree Grab & Go can be prepared in only 12 minutes by just adding boiling water. 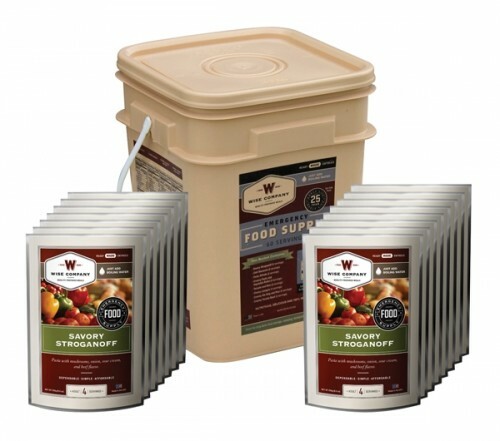 Perfect for preppers, survivalists, or campers, this 13” x 9” x 10” bucket is designed to feed 1 adult for 1 month or 4 adults for 1 week. It has a shelf life of 25 years and contains 8 savory stroganoff, 8 cheesy macaroni, 8 pasta alfredo, 8 creamy pasta & vegetable rotini, 8 teriyaki & rice, 4 cheesy lasagna, 8 creamy a la king & rice, and 8 tomato basil soup.